Key Difference: Any and all businesses that have anything to do with food have to get a license from FSSAI in order to operate. However, a business whose turnover is below 12 lakhs annually or if their production capacity is below 100kgs per day, need not get an FSSAI License, but rather can get by with just an FSSAI Registration. 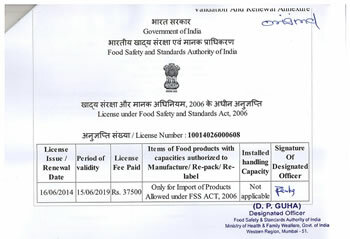 FSSAI stands for Food Safety and Standards Authority of India. It is a regulatory authority created by the passage of the Food Safety and Standards Act, 2006. The agency is currently looked over by the Ministry of Health & Family Welfare, Government of India. The objective of the FSSAI is to ensure that any and all food that is manufactured, distributed or sold in India is safe for consumption. In order to complete its objective, the FSSAI requires all food related businesses to either register with FSSAI or get a license from them. FSSAI licenses and registration regulates the manufacture, storage, distribution, sale and the import of food items. However, there may be confusion relating to whether or not one requires an FSSAI License. Any person or company that deals with food produces it or even just transports it, needs an FSSAI License, according to the law. However, they may be able to get away with just registration under certain conditions, such as if their turnover is below 12 lakhs annually or if their production capacity is below 100kgs per day. The benefit of this small time business owners, such as shopkeepers or hawkers do have to bear the expense or deal with the bureaucracy of getting a license. They can just get an FSSAI Registration and start their work or business. Anyone who manufactures or sells food by themselves, such as a petty retailer, hawker, temporary stall holder, etc. Any other food related business that falls outside of the scope of these must get a license. However, there are two different types of licenses that a business can apply for: State FSSAI License and Central FSSAI License. As the names suggest, the state FSSAI license is issued by the state level authorities, while the central FSSAI license is issued by the authorities of the central government. Large food manufacturers, processors, transporters, and importers of food need to obtain the Central FSSAI License, whereas medium sized manufacturers, processors, and transporters can make do with a State FSSAI License. Once obtained, the FSSAI License can be valid from anywhere between 1 year and 5 years, after which the business must renew the license. Here, the license can be suspended if the authorizes find that the quality and safety of the food has not been maintained.